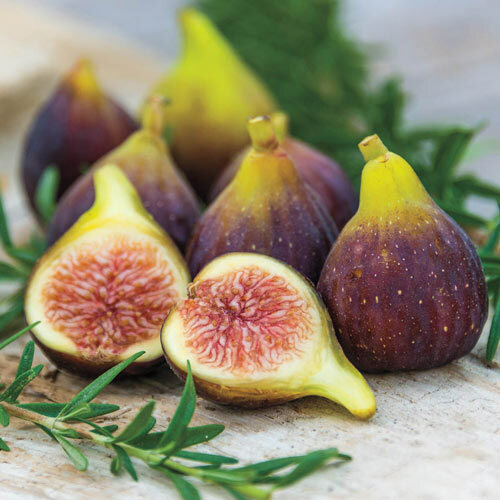 Fig Fantasia™ | Gurney's Seed & Nursery Co. This Louisiana State University release is a flavor favorite of our research staff. The large, black-skinned fruits offer a perfect mix of acids and sugars, giving them an intense fig flavor. The fruits have attractive pink flesh and mature in late August. Figs should be allowed to ripen on the tree—and are excellent for fresh eating and dried. Fantasia Fig trees produce fruit two years after planting and are resistant to fig diseases. Growing up to 25 ft. tall, the trees are quite ornamental with large, tropical-looking green leaves. They can be grown as specimen plants or in patio containers. This variety is well adapted to the humid Southeast. Self-pollinating. Zones 7-9. FoliageLarge, tropical-looking, glossy green, lobed leaves. FruitClosed eye large, black skin, pink flesh. Intense fig flavor perfect mix of enhancing acids and sugars. PruningDoes not require regular pruning once established. Prune fig trees annually during the first three growing seasons to establish desired shape. Best to prune immediately after the main crop is harvested in early fall. CommentsExceptional flavor- described as pronounced intense 'fig' flavor with lots of sugars and acids. Beautiful appearance. Enjoy luscious, juicy figs right out of your own backyard! DepthPlace the plant in the hole at the same level it was grown by the nursery. This is where the roots start and the tops shoots begin. Spread the roots out evenly. Gently work the soil around the roots but do not pack the soil. Water plant thoroughly.